One month after the release of Battle Beasts #1, Comixology digital readers can now get the IDW comic book for only $1.99. The issue is a must have, and here's why! Valerio Schiti's interior art is revelation. I had not heard of Schiti before Battle Beasts, but his panels contain so much energy that I can't wait a month for issue #2. 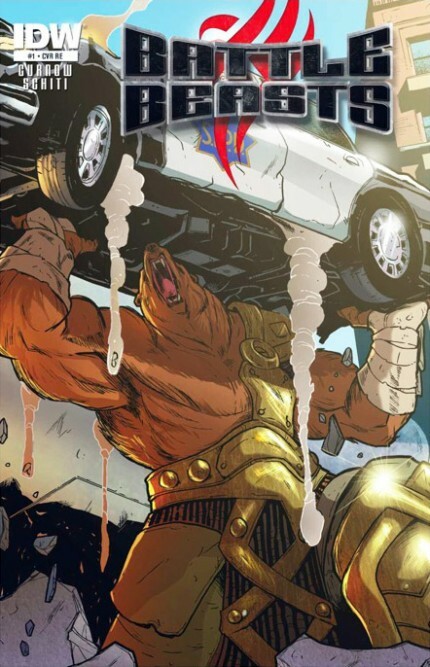 I may purchase Battle Beasts #2 at the full $3.99 price! The various character designs are lively and fun to see in multiple battle positions. Plus, Schiti's ink work helps make his imagery pop off the page: nice separation and depth control. The story is basically filled with huge animals such as bears, walrus and hawks that battle like humans would with swords, spears and axes. Powerful weaponry in the hands of powerful beasts? Yes, please. If you liked the television cartoon show Dinosaucers when you were young, you'll like Battle Beasts. Battle Beasts #1 is 32 pages long. At only $1.99 you are definitely getting your bang for your buck. Did I mention the art? Soooo good. #5, Battle Beasts were (are?) radical!